People go to Brussels for chocolate, fries, chocolate covered fries and architecture. At least so I’ve been told. I’d like to add one more reason to the list. Sunsets. I know when thinking about a city a sunset isn’t the first thing to come to mind. Which is a shame because you can find really beautiful ones. Even if the city is very far from the beach. The sunset in Brussels is one of the best ones I’ve seen. It’s an experience I think everyone that visits Brussels should give themselves. First let me tell you where all you can watch a gorgeous sunset in Brussels. There are two places. The first is at the Justice Palace, which is the focal point of this post. The sunset is more in the neighbourhood of the Justice Palace so when you’re facing the Palace walk about 50 meters to your right and when standing with your back to it, it’s about 50 meters to your left (obviously😋). 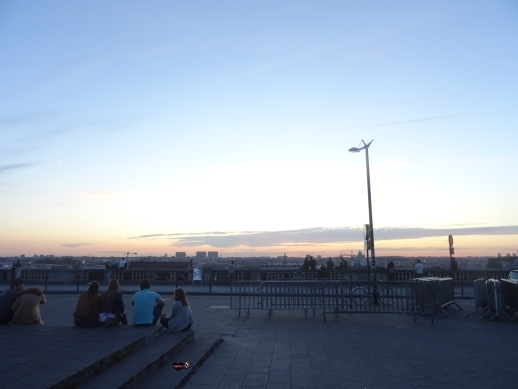 The second place where you can watch a sunset in Brussels and enjoy a glass of wine* at the same time is at the Mont des Arts. There is a restaurant/bar at the foot of the Mont des Arts where you can sip and watch the sun go down. I was at the Justice Palace as I mentioned before. There you have an unbeatable view of Brussels and I’m not talking just Brussels city. You can see well into the province! All doubt you had about Brussels being a big city will be eliminated immediately. 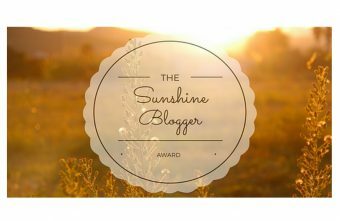 The best part about this gorgeous view is that you can see the sun disappear behind the mountains. Not sure if they’re really mountains but it is what they appeared to be from my viewpoint. Something that was a new experience as I mostly watch sunsets at the beach. Also most of the monuments that are on the tourist to see list, even the ones that are far from you, are visible giving 100% postcard vibes. 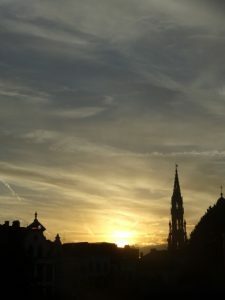 The best part of watching the sunset in Brussels at the Justice Palace is the fact that you are kind of in the middle of the city yet it doesn’t feel that way. Mind you though there is heavy traffic about a 100 meters from you. It’s just that watching the city take on the different glows of the sunset is so mesmerizing that the traffic noises become unnoticeable. To me it really felt like I was watching the city transition from day to night. I know that is essentially what happens however… Have you seen the lights come on in your city or better yet seen the transition of beautiful architecture from day to night by turning their lights on? Exactly my point. In a split second the entire view changes. The combination of the traffic noise becoming white noise and being confronted with the majesty of Brussels made me really think about life. About how fragile it is and how fast paced everything is going. Standing there watching made everything slow down and open room to just appreciate all that is for what it is. It made me realize that if you don’t stand still once in a while you’re going to miss it all. The little moments in the big moments and the little every day moments. Getting to this calm reflecting state makes you want to stay there forever even when the sun has long set. Watching the lights in the darkness of the night has its own charm especially when you look up and find yourself staring at a sky of stars. 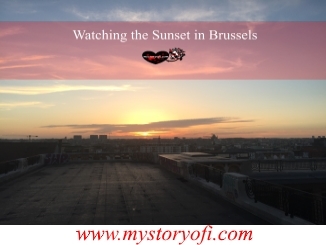 Watching the sunset in Brussels is an out of city break in the middle of the city. *Always respect the legal drinking age and if you’re going to drink do it responsibly!